Rod Loadsman accepted a silver award at the 2010 awards dinner hosted by the Australian Signs & Graphics Association which was held in Sydney. The award was for 'Orginal In-House Design Concept'. Big Promo is proud to be able to offer our clients the 3M Roland ACS warranty. This Alliance Component System covers selected 3M media when printed with Roland Eco-Sol Max inks. 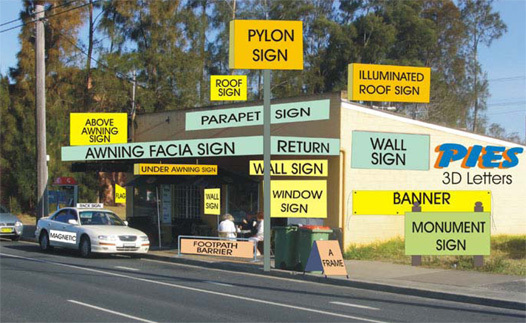 We are preferred suppliers of the very popular Vista System. Click below to find out how this versatile and modern modular curved frame system can provide display solutions for your business. The system is ideally suitable for indoor and outdoor applications. Signs are all around us. They are a necessary investment for most business activities and their presence and visual appearance are one of the first things a customer notices. First impressions are formed based on their quality, quantity and content. They are used to identify, promote and inform and may be short-term, long-term, temporary, permanent, portable, illuminated, electronic etc. 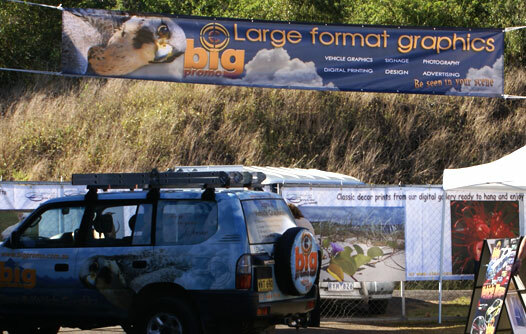 The traditional banner is an economical solution for indoor and outdoor marketing events. They are strong, durable and get you noticed at markets, expos, trade fairs etc. 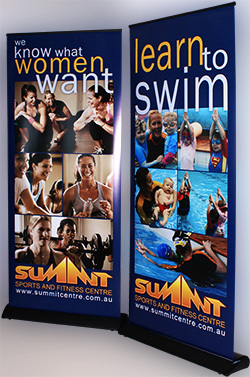 Our banners have a high quality finish which includes welded edges and hems that are welded and sewn. 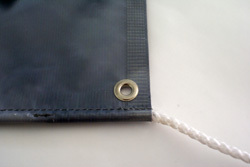 We offer a choice of eyelets only, or eyelets and ropes sewn into the hems top and bottom. This further increases their versatility. Go to our pricing page for further details. They are self-supporting, portable and are supplied with their own carry bag making transport and storage easy. 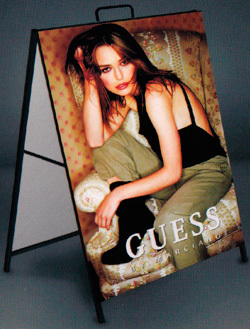 The finished size of our deluxe pull up banner is 850mm wide x 2000mm high. The graphics are printed on a premium 250um PVC/Polyester composite film. This film provides excellent printing results with minimum curl, antistatic finish and low crease properties. The are constructed of a tubular steel frame with steel face - front and back, and a carry handle on top. The options are endless. Contact us with your specific requirements, and we'll be happy to discuss your unique situation and work with you to accommodate your needs.